Heavy glass is often used in structural glass railing systems because the heavy glass can withstand the forces required by local codes. 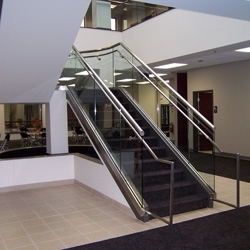 Tempered and laminated glass is set into an aluminum base shoe and fastened in place to be rigid enough for handrails. The glass is topped with different types of aluminum stainless brass or even wood railing caps. When the glass is thick enough to serve as the structural component we refer to them as structural glass railings. When different posts are used as the structure, thinner glass can be used as decoration and function but would not be structural. Glass handrails are a beautiful high end looking building product that can be functional, practical and versatile.